Ascents and Descents in Realtime, Alex Monteith, 2008, (23.03.08 v2) HD from Alex Monteith on Vimeo. 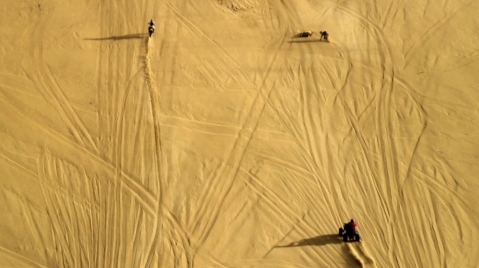 Moto-x riders attempt to ascend the huge fifty-degree dunes near Ahipara, Northland. The work is a single realtime take of the riding antics of moto-x and raptor/quad bike riders. The audio is diagetic stereo sound.